There are some places on earth that are truly special. Mongolia is just such a place. It is a land of enchantment, with one foot in the modern world and one firmly rooted in its illustrious past. The people of Mongolia are proud and friendly. The landscape is breathtaking, unlike anywhere else on the planet. And, Mongolia has played a major role in shaping the course of human events, from the Buddhists and their monasteries scattered across the country to the infamous Genghis Khan. In the past, visiting Mongolia was an adventure. There were few hotels and venturing outside the capital city of Ulaan Baatar was a rugged experience. All that has changed now as Mongolia, and the Mongolian people, embrace their land and culture and welcome the world to this unique country. 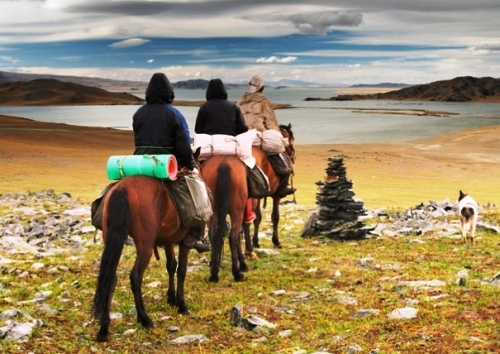 If you are looking for a luxury tour Mongolia, one that provides comfort and style, you will not be disappointed. Our tours will allow you to experience Mongolia with expert local guides, including in the capital city of Ulaan Baatar. You will be met at the Chinggis Khan International Airport, just 40 minutes’ drive from the city. Once at your hotel, you will be in the comfort of contemporary furnishings, modern restaurants, a health club, and of course, complimentary Wi-Fi internet service. Nomadic herdsman makeup a significant portion of the Mongolian population, even today. These tribes move their homes periodically to find the best grazing land for their animals. Understanding their lifestyle by spending time with nomad families is an experience most people will never have. You can experience their disappearing way of life as you travel throughout the land, staying in your ger, the traditional felt housing of the nomadic people. You will have your own private guide and drivers who, after a day of adventure in nature, will return you to your own ger, an abundant and healthy meal and friendly staff to meet your needs. Deluxe gers are available in some camps and usually feature ensuite bathrooms with showers, and often their own air conditioning too. Deluxe gers are equipped with full size king or queen beds. We want your visit to Mongolia to not only be memorable because of the striking landscape and ancient history, but also because of the Mongolian people. On our luxury tour Mongolia, you will have your own private guide who can share their own experiences about local customs, traditions, and history, and who is also there at any time to make your trip easier. Our team will take care of all the logistics of your trip, from transportation, to accommodation, to food and dining so that you can truly experience our land and our people worry-free and in comfort and style.